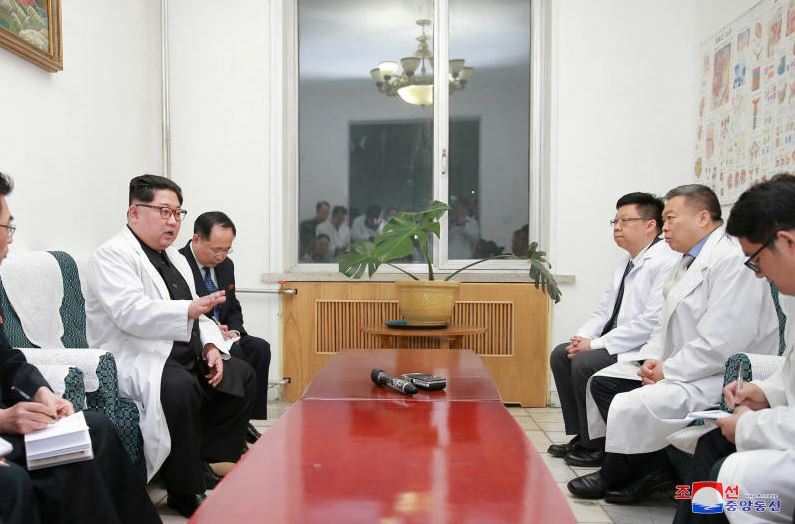 North Korean leader Kim Jong Un visits a hospital following a bus accident involving Chinese tourists in North Hwanghae province in this undated photo released by KCNA via KNS. North Korea’s leader Kim Jong Un visited China’s embassy in Pyongyang to express his “bitter sorrow” after a bus crash killed dozens of Chinese tourists, state media reported early Tuesday. In a rare admission of negative news from North Korea’s tightly controlled propaganda network, the state-run KCNA news agency ran a report saying Kim met the Chinese ambassador early Monday, and later visited crash survivors in hospital. “He said that the unexpected accident brought bitter sorrow to his heart and that he couldn’t control his grief at the thought of the bereaved families who lost their blood relatives,” KCNA reported. The report said the crash was caused by “an unexpected traffic accident that claimed heavy causalities among Chinese tourists.” It gave no details on the numbers killed or injured. Kim’s visit to the embassy will be seen as an indication of how seriously Pyongyang takes the accident. The KCNA report twice mentioned Chinese officials thanking Kim for taking time out of his “busy” schedule to meet them following the crash. “The ambassador and staff members of the Chinese embassy here repeatedly expressed gratitude to Chairman Kim Jong Un for showing deep care and personally taking detailed measures as regards the recent sudden accident though he is busy with his important political schedule,” KCNA reported. North Korea’s sole ally is China, which provides an important economic and political buffer against international opprobrium. Relations have been strained by Pyongyang’s nuclear weapons and missile tests, which prompted Beijing to back a series of United Nations sanctions last year. Pyongyang has made moves to mend fences with Beijing ahead of a summit on Friday with South Korea’s President Moon Jae-In followed by a planned face-to-face with United States President Donald Trump. In March, Kim paid a secretive visit to Chinese President Xi Jinping in Beijing, his first known voyage outside his country’s borders since he assumed power in 2011.